Snow seems to be on the minds of many this week (though not so much here in Southern California). Here are a few stories about how cities with colder weather than us are addressing the problems that come along with all that white stuff. Meanwhile, Grist's Ask Umbra offers some advice to a reader who wonders, What do I do about my treacherous sidewalks this winter? Hint: the best solution involves beet juice. After a winter storm, snow ploughed to the side of the road creates temporary neckdowns and demonstrates the principle in action. 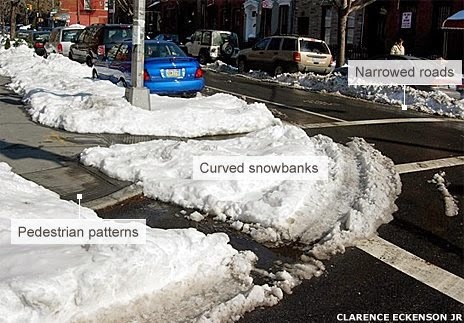 "When that snow piles up at a lot of intersections in neighbourhoods, you see that space where they could put a kerb extension," says Eckerson. "The cars still can make the turn, including trash trucks and school buses, but you see the slow, more deliberate turn around the corner instead of cutting it."